In Kirkwall on the A960. The Bishop's Palace is a 12th-century hall-house, later much altered, with a round tower built by Bishop Reid in 1541-48. 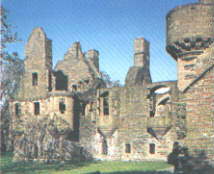 The notorious Patrick Stewart, Earl of Orkney, built the adjacent Earl's Palace between 1600 and 1607. Joint ticket for all Orkney monuments. A long cairn bounded by a retaining wall, with a chamber divided into seven compartments. Of Neolithic date. The ruins of a Norse church of the 12 century and of a Norse village. At Aikerness, 14m NW of Kirkwall on the A966. Surrounded by a warren of Iron Age buildings, this broch probably dates to the 1st century AD. Vikings may have built the long house on top of the ruined broch. The grave of a Viking woman was found nearby. Joint ticket for all Orkney monuments. The last surviving horizontal water mill in Orkney, of type well represented in Shetland and Lewis. In working order. The castle is probably one of the earliest stone castles to survive in Scotland, built in about 1145 by the Norseman Kolbein Hruga. It is a small rectangular tower enclosed in a circular ditch. The ruined chapel is of late 12th century date, in Romanesque style. A low mound covering a Neolithic chambered tomb with four cells. Contained the bones of men, dogs and oxen when discovered. A huge block of sandstone in which a Neolithic burial chamber has been cut. The gaunt remains of the residence of Robert Stewart, Earl of Orkney, constructed round a courtyard in the late 16th century. The ruins of a 12th century church and a group of domestic buildings. A well built Iron Age earth-house, with underground chamber supported on stone pillars. One of a pair of towers built between 1813 and 1815 to provide defence against French and American privateers for British convoys assembling in the sound of Longhope. Provided a base for a 25 pounder cannon and its crew. A massive tomb, with a long, narrow chamber divided into three, with 14 beehive cells opening into the walls. There are engravings on the walls. Probably the oldest standing stone houses in north-west Europe, dating from the early Neolithic period. Two houses approximately rectangular, with stone cupboards and stalls. 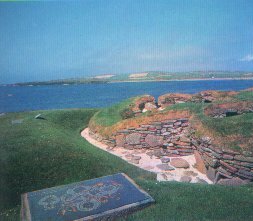 Contemporary with the chambered tombs of Orkney. An oval cairn with concentric walls enclosing a chambered tomb divided into three compartments. Of Neolithic date. 9m W of Kirkwall on the A965. This world famous tomb was built in Neolithic times, before 2700 BC. The large mound covers a stone-built passage and a burial chamber with cells in the walls. Runic inscriptions tell of how it was plundered of its treasures by Vikings. Joint ticket for all Orkney monuments. Admission, shop and refreshements at nearby Tormiston Mill. 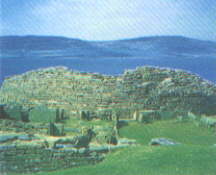 A well preserved broch, with remains of later buildings round it. A huge and impressive megalithic chambered tomb in an oval mound, with 25 stalls. Of Neolithic date. Now protected by a modern building. A fine ruined Z-plan tower, built between 1560 and 1573 but never completed. Remarkable for its large number of hun loops and impressive staircase. The Earl's Bu is the name of the foundations of ancient buildings which may be an Earl's palace of the Viking period. 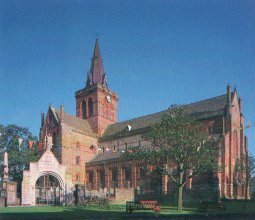 The church is of 12th century date, and consists of the chancel and part of the nave of the only medieval round church in Scotland. The ruins of a medieval church with some finely lettered tombstones. A megalithic tomb with triple retaining walls, containing a passage and main chamber, with six subsiduary cells. Of Neolithic date. A good example of an Orkney earth-house, like that at Grain. A magnificent circle of upright stones with an enclosing ditch spanned by causeways. Of late Neolithic date. The complete but roofless ruin of a 12th century church with a round tower, dramtically sited. Uncovered by a storm in 1850 Skara Brae is one of the best preserved groups of Stone Age houses in western Europe. The houses contain stone furniture, hearths and drains and present a remarkable picture of life of Neolithic times. Joint ticket for all Orkney monuments. The remains of a stone circle surrounded by remains of a circular earthwork. A megalithic chambered mound with two burial chambers, one above the other, Of Neolithic date. An excellent late example of a Scottish watermill. It was probably built in the 1880's. The watershed and most the machinery have been retained. Now forms a reception centre for visitors to Maes Howe. A mound covering a stone burial chamber divided by slabs into five compartments. Of Neolithic date. A fine chambered cairn with three concentric walls and a burial chamber with three large cells. Of Neolithic date.